Happy Thursday everyone! WHEW…I thought i wasn’t going to get the post up! We’ve been having Internet problems and (as of Wednesday evening) getting ready for some major storms coming through. But I had a little window where my Internet was up so I could get a cool card together for you! Since it is Thursday, it is time for another Create with Connie and Mary Thursday Challenge and it is a FABULOUS color challenge – Pear Pizzazz, Lost Lagoon, Smoky Slate! My Cheerful Tags set JUST arrived so I had to use it! All is Calm dsp (striped print) – 3 1/2 x 4 3/4, stamp snowflake in Lost Lagoon and layer onto Lost Lagoon – 3 5/8 x 4 7/8. Add piece of Lost Lagoon print 1 1/4 x 3 5/8, add a strip of Pear Pizzazz behind it and add to panel. Wrap piece of Silver 1/8″ Taffeta Ribbon around panel and add to card front using dimensionals. Staple piece of Lost Lagoon Silky Taffeta ribbon to the top and add tag using dimensionals. Add both large and small silver sequins to the card to finish off. 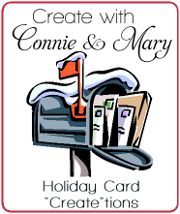 We just finishing up week 2 of Create with Connie and Mary Holiday Card “Create”tions! This time we are doing an ALL CARD collection…how cool is that??? You don’t want to miss it! This week is the all about Christmas (and so is next week!) and you can get 3 week of all cards (1 week Halloween/Fall and 2 weeks Christmas) for only $19.95! AWESOME!!! So head over to Create with Connie and Mary to learn more and subscribe today! This entry was posted in Create with Connie and Mary, Holiday Mini and tagged Cheerful Tags. Bookmark the permalink. Mary, Cute card, as usual. Help! I am having trouble finding the cheerful tags set. Cute card. Cheerful Tags is page 5 in the holiday mini. That’s a darling card. You really maximized the designer paper and sequins! Love the stamping on the DSP and the oh-so-cute layered tag! This is so pretty! Love the tag and the stamped images on the dsp! The sequins are perfect, too! I really like the custom DSP you created! The sequins are a great addition of sparkle! Love.Love.Love! This has turned out to be one of my favorite sets! I love that you stamped snowflakes on DSP.